On June 13th, 2017, Patrick Vaughan, a U.S. ultra-trail runner from Virginia, completed his run of the entire 470km long Lebanon Mountain Trail (LMT), breaking the previous record of nine days, and setting a new Fastest Known time (FKT) record of six days and 17 hours. In celebration of Patrick’s run, on September 20th, 2017, the American Friends of the Lebanon Mountain Trail (AFLMT) – a tax-exempt organization established in Washington, DC in 2009 to promote the LMT among the Lebanese diaspora and all nature lovers – held a fundraising dinner and invited Patrick to share his experience and story. AFLMT president Joseph Karam welcomed the 60+ guests and captured the audience as he told the story of the LMT from its inception in 2007, stressing the important role that the LMT Association (LMTA) in Lebanon now plays in maintaining and promoting the trail and the natural and cultural heritage around it, and in developing new sustainable economic opportunities along the trail’s gateway communities. Joseph encouraged everyone to continue to support the LMTA by donating to the AFLMT, so that the LMTA may continue the hard work of protecting the trail. 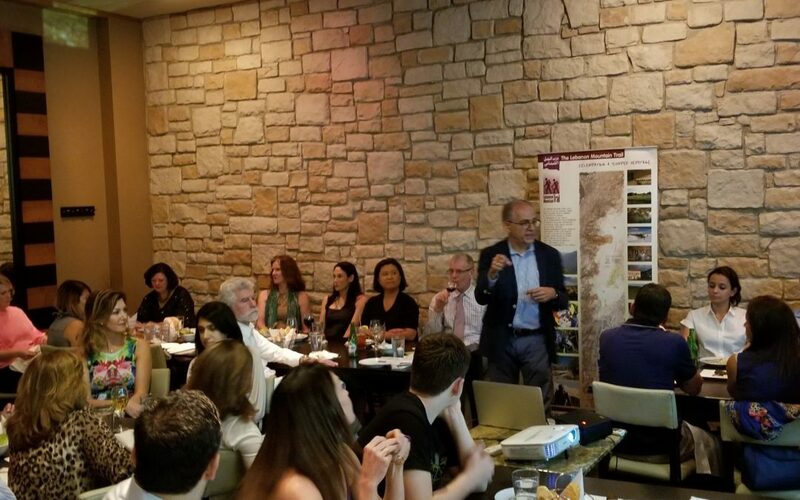 Guests enjoyed a delicious dinner at the Lebanese Taverna restaurant at Tysons II in McLean, VA, while Patrick joyfully counted his adventures and memories of running the LMT, and answered questions from the audience. Patrick spoke of the generous support received from the LMTA, of the warm welcome of the local sports groups and associations, of the runners that shared the trail with him, of the unrivalled hospitality of the villagers and the guesthouse owners – and the excellent food he tasted there – and of the unbelievable kindness of every shepherd he met on his mountain route. Patrick also shared a movie series he and colleagues had filmed on the trail for every day of his seven-day LMT Run, with the support of local producers. Throughout the evening, magnificent Lebanese mountain sceneries projected on a screen, as a nostalgic audience held their breath in awe and cheered at the appearance of familiar sights that have been sorely missed. The event proved to be a memorable gathering that left guests in a joyful spirit, eager to discover and perhaps set new records of their own on the LMT.